Director Wook Choi published her second book titled Art College Admissions II. Stemming from 35+ years of experience as an artist, art educator and art dealer, Wook delivers tips and guidance on creating the best portfolio, including examples of student work, and provides insight from interviews with industry professionals in all creative fields including fine art, design, & architecture. Over 40 colleges and universities were interviewed to highlight their best programs and developments in their schools. This is the best updated resource for anyone looking to enter a college or university to further their art education. 12 Scholastic Art National Awards were given to students at the national level this year. 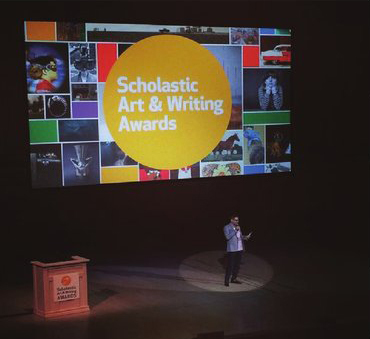 The 2016 Scholastic Art & Writing Awards Ceremony was held at Parsons School of Design. Once again, Oogie Art beat their record with a total of 188 Key Awards! The Scholastic Art & Writing Awards is a renown competition, recognized by virtually every art education institution in the world. This is the best opportunity for students to become engaged with other artists and share their creative voices in a diverse setting. It’s also a crucial component to highlight their achievements during their college admissions. Three students from Oogie Art were recognized for their artwork in the National Young Arts competition. Aaron Smithson was chosen as a finalist as one of 12 out of 12,000 students in the USA and invited for a workshop and exhibition at the museum in Miami. He was also awarded a $10,000 Presidential Scholarship. His architectural portfolio displayed organic pieces inspired by the sea and incorporated a wide use of mixed media. Aaron's portfolio is also featured on YoungArts. The Young Arts competition is highly competitive, and we feel honored to have our students recognized for their artistic achievements. Congratulations Aaron Smithson (Trinity School, Oogie Art), Mary Safy (Stuyvesant Highschool, Oogie Art) & Eunyoung Lee (Lexington Highschool, Oogie Art)!! Oogie Art Gallery hosted a Charity Fundraising Show for the Scholarship at the Talent School in Uganda. Featuring Mark Chearavanont’s black and white photography, many pieces were sold and the funds will go towards raising money for the Kasangula Talent School in Uganda. Mark is an Oogie alumni, and he was accepted from Harvard University. Admissions officers from Central Saint Martins located in London, England visited Oogie students for a presentation on the admissions process and the various programs being updated at their school. Each year, several Oogie students apply to Central Saint Martins (part of the University to the Arts London) for their renown fashion major. Amongst their alumni includes Alexander McQueen and Stella McCartney, and each year a few Oogie students are admitted despite the heavy competition. Titmouse Studio is a full-service animation studio. Christy Karacas is Supervising Director and visited Oogie Art to give students a once in a lifetime presentation of his experience in the industry. Students then had the opportunity to visit the studio and experience firsthand the inner workings of a real animation studio. Titmouse creates content for TV shows, films, commercials and branded and digital content, including well known TV shows like SuperJail and Rick & Morty. Christy will be one of the featured professionals in Wook’s upcoming book titled Art College Admissions II. Students from Oogie Art visited the Kasangula Talent School and Mityana Village in Uganda as part of the Uganda Leadership Program. Students conducted art classes and installed a well for clean water in the community. The project is the first step in a series of changes that will take place in the community, including an installment of electricity at the school. It was a great opportunity for Oogie students to connect with the students, creating artwork together and bringing about positive change. Caryl Glaab is the creative director of the Blue Man Group, a trio of bald blue men that perform absurd theatrical acts like banging on PVC pipes all choreographed to drumming beats and no dialogue. Glaab talked about the importance of being present during the design process and gave Oogie students an extensive presentation on creating the look and feel of Blue Man Group. Designer talks like these help students gain advice and insight into the design industries from professionals. For a few days, Oogie students traveled to Washington D.C. to participate in our Art Leadership Program, which is part of the International Child Art Foundation, an enrichment program that provides workshops and art lessons for students all over the world. Oogie students met with several mentors and connected with local students to bring about different art programs. Director Choi emphasizes the importance of being a leader and not a follower, and this was a rare and uplifting opportunity for students to share their knowledge and creativity with their peers and children. Tagged: Leadership, Summer Art Program, Volunteer, Art Workshop, Oogie Global, 2015. Congratulations to our very own Oogie Art alumni Alex Khomyakov for becoming a design assistant at Apple Inc. Alex graduated from RISD studying graphic design and interned twice at a Swiss design company called Department. His hobbies include surfing and learning new languages. You can read more on his experience at RISD, Apple, and his advice to students in the new publication of Art College Admissions II. The Scholastic Art National Award Ceremony took place at Carnegie Hall in NYC. 12 National winners attended from Oogie Art. Oogie art beats its own record for the Scholastic Art & Writing awards each year. Diane Kim published “Landscape Explorers” working with the Oogie Art Research Team. Landscape Explorers is an exploration of landscape artwork from all around the world, starting from the 17th century to contemporary work. Kim was accepted from Columbia University. The work of Ugandan students was featured in the Oogie Art Gallery this December. The work is the result of a collaboration between Oogie Art students and the children of the Mityana Village at the Kasangula School. Students discussed their experience and talked about their leadership roles during their visit. Oogie Students had a group show at the Time Warner Cable building. The show was titled “Digital Technology Art” featuring work from students that used Adobe Photoshop and several other digital platforms to edit their work, a combination of photography and mixed media. New York Times Article: Laura Anderson Barbata's "Stories and Stilts"
Oogie Art was mentioned in the New York Times article featuring the performance artist Laura Anderson Barbata’s program “Stories and Stilts” at the BRIC House through August 31st. The event featured is part of the Oogie Art Internship experience. During the program, students lead families through the “Transcommunality” show and presented a Korean folk tale titled “The Pious Daughter” Lots of preparation went into this and it was a great opportunity for students to experience installation and performance art firsthand. We are so proud of all the Oogie Art Students that participated! Oogie Art will be traveling to Uganda for another Leadership Program. Students will help launch art programs for orphans and children in Africa at the Kasangula Talent School in the district of Mityana and the Gaba Orphanage Home at the Bethany Children’s Village. This will be a great opportunity for students to connect with the children and learn great leadership skills. Marco LaFiandra is a Designer and project manager at DDC Designpost. He moved to New York City 6 years ago from Italy and studied Industrial Design in college. Marco gave a presentation about the design process and experience of being a designer from both Italy and NY. His advice for students was to never abandon their personal vision and mission, and to always connect with clients on a deeper level. Maren Hassinger is the Chairwoman of the Sculpture department at the Maryland Institute College of Art. She’s known for her public art using industrial and natural materials. She also works in performance and video. Oogie students participated in a group sculptural installation and had a group discussion. 2019 © Oogie Art. All rights reserved.